In partnership with the El Dorado County Office of Education (EDCOE) and school districts, Operation School Bell identifies families who qualify and would benefit from assistance. The program organizes shopping days at several locations throughout El Dorado County, including K-Mart in Placerville and South Lake Tahoe. 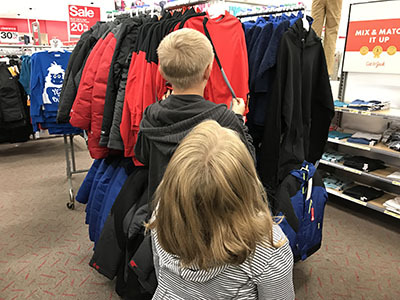 Students and families select clothing items that cost up to $100. When they check out, families only have to pay the balance if the total exceeds the allotted amount. Upon checking out, students also receive a new book donated by First Books. Assistance League volunteers work with families throughout the event to help track costs. School counselors and representatives also volunteer their time to ensure that families make it to the event. Occasionally, school representatives help transport the children if parents or guardians are unavailable. This year, 640 students were able to participate in the program. The Assistance League of Sierra Foothills has grown to 109 members since its inception in 2008. This volunteer-driven organization is bound by a strong central mission to help people in need achieve a better quality of life. Volunteers live in the communities they serve, and all monies raised are locally spent. Last year, members contributed more than 13,700 volunteer hours and raised more than $132,800 through fundraising, private donations, grants, and membership revenue.